The Spy Command website reports that a TV series about Ian Fleming's Thrilling Cities is in the works. Actor Michael Weatherly’s production company is trying to turn Ian Fleming’s Thrilling Cities book into a television, according to The Hollywood Reporter. The story is mostly about Weatherly’s impending departure from the popular NCIS television series and Thrilling Cities only gets a passing reference. “In the meantime, however, Weatherly said he’s busier than ever with his production company, Solar Drive Productions, which is working on turning the book Thrilling Cities, from James Bond author Ian Fleming, into a possible series,” the story by THR’s Kate Stanhope reads. 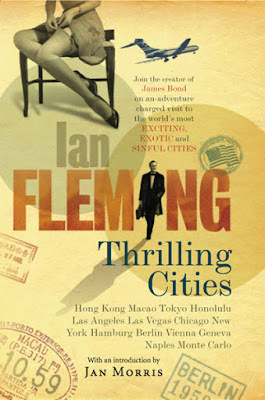 Thrilling Cities was a non-fiction book by Fleming. It was based on a series of stories he did for The Sunday Times about important cities around the world. Note: When I traveled the world while serving in the U.S. Navy back in the 1970s, I carried a paperback copy of Ian Fleming's Thrilling Cities with me. I was pleased that I was able to visit some of the cities Fleming himself covered years before. I read the Ian Fleming nonfiction book about his visits to the most interesting cities in the world some years earlier after I had read through his James Bond thrillers. Thrilling Cities covered vice, crime, espionage and other fascinating aspects of the great cities. Fleming, a journalist as well as an author and former naval intelligence officer, originally published these stories in his newspaper, the London Sunday Times. Ian Fleming said he looked at places and things through a thriller-writer's eye. "With his interest in crime and espionage, Fleming interviewed Charles "Charlie Lucky" Luciano, the exiled prince of American organized crime, in Naples. In Berlin, he interviewed a Cold War spy, and in other cities he interviewed detectives, crooks, journalists, authors and interesting people, " I wrote in my Crime Beat column on the book. "This is not your typical travel book."